I'am working on a little guide about clothes, since clothes are one of the more important feature about Saint Seiya. It's pretty much a Work In Progress, so it is incomplete and can be incorrect. If something need a correction, don't hesitate to say it. If you have anything to add too. 3 kind of clothes are avaible: Bronze, Silver, Gold. Gold are more powerful than silver, and silver than gold. There is 3 level of bronze clothes and 2 level of silver clothes: lvl 1 bronze clothes are weaker than lvl 2 bronzes clothes, which are weaker than lvl 3 bronzes clothes, wich are weaker than lvl 1 silver, which are weaker than lvl 2 silver. Though, original clothes can be upgraded far more than other clothes, so they can be more powerful than any other cloth. Every class of saint should use a determined set of clothes in order to unlock skills. How do I use clothes ? 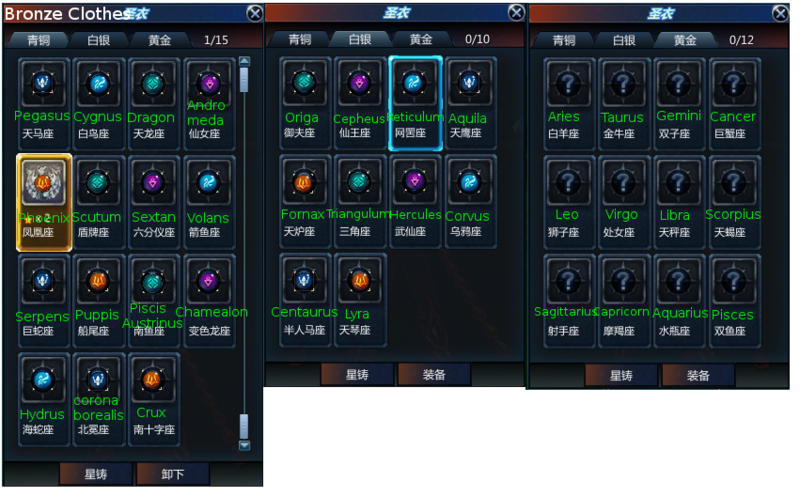 From here, you can choose the cloth you want to use/upgrade. Double clic on a cloth will make your character wear it. Double clicking on the cloth you are wearing will make you clothless. Selecting a cloth and clicking on the bottom left button will open the upgrade menu. When putting your cloth on, all your stats are increased. 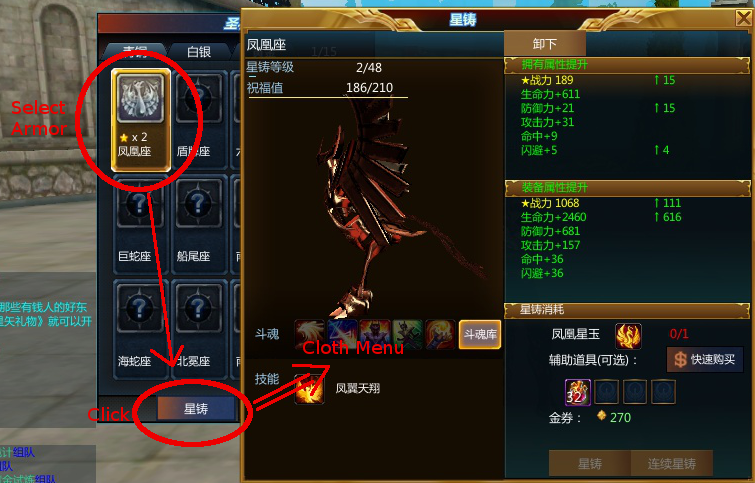 To wear on/off your cloth, double click on your cloth box in the H menu. Where can i get new clothes? You can buy bronze and silver clothes in the main town, by buying them to armor shop, and then doing some quest involving fighting mobs in Arena. Since Arena zone have Cosmos restriction, it means that you need enough cosmos to get to those area. How can i uprade my clothes? What did i gain by upgrading my cloth? 1. Serpens : Ophiuchus / Snake. (Ophiuchus Shaina). @raditzroom wrote: 1. Serpens : Ophiuchus / Snake. (Ophiuchus Shaina). Pretty sure it does not work like that. Serpens is 巨蛇座 in chinese. It is often considered as a bronze cloth - still, there is no canon serpens saint, closest is the sea serpent ghost saint. Ophiuchus is 蛇夫座 in chinese. It is considered as a Silver Cloth. Ophiuchus Shaina is often mistook for the snake saint since she use snake related attack, but she is not. Anyway, i think the choice of clothes look really weird, there is a lot of bronze and silver saint that are never have been shown in the manga, so it is not impossible that some/a lot are mistranslated. Yeah and we do have the serpens cloth that is bronze. 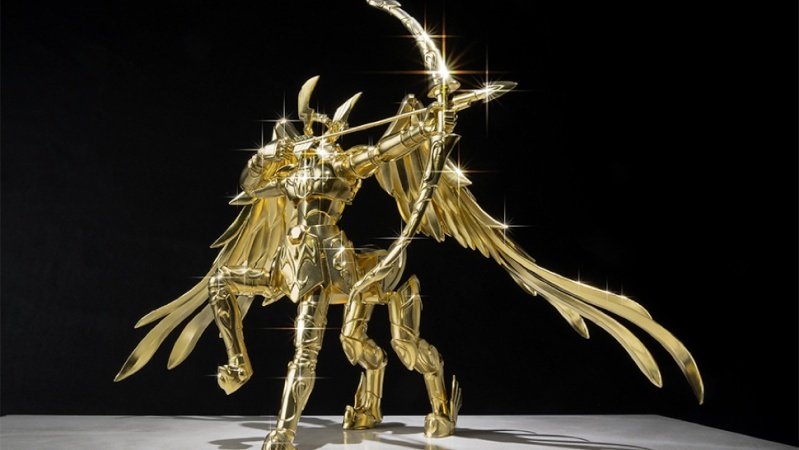 Speaking of Ophiuchus, and out of topic, in ND they will show the Ophiuchus Gold Saint, that is gonna be awesome. Well, i didn't really check the 5 first, since it was the "original" clothes. I tried this because i was curious to know what others clothes were in the game. And, well, this topic is now pretty useless since BadPic posted the bronzes and silvers clothes in the screenshot section. Maybe i should just update the pict anyway.